Earlier Microsoft had expressed its penchant towards supporting other platforms. We even came to know about Microsoft’s intention to bring Cortana for Android and iOS. In the first quarter of 2015, news were circulating that Microsoft will introduce new tools for iOS and the tools will be a part of the project Islandwood. The aim of the project Islandwood was to aid the compatibility of the Windows OS to port apps from iOS without any hazard. 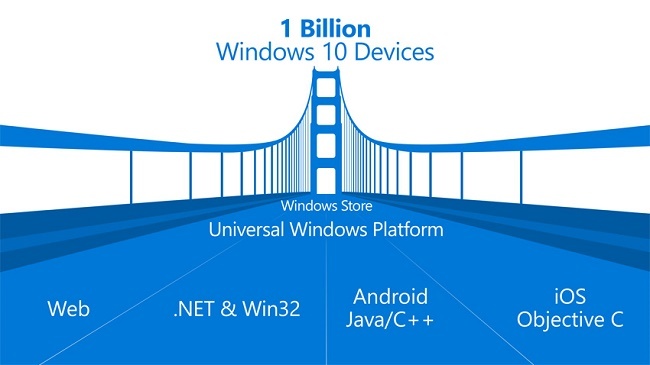 Finally Microsoft announced that the company has open sourced the Windows Bridge for iOS project. This open sourcing will help developers in porting their apps, testing their codes and skills in Windows OS. The primary objective being open sourcing Windows Bridge for iOS is the convenient use of Windows APIs within Objective-C code, re-using existing iOS codes as much as permissible and growing a compatible platform for both iOS and Windows APIs. 1. Objective-C compiler: To enable most of the heavy lifting, Visual Studio will include a compiler that knows how to take Objective-C code and compile it into a native Universal Windows app. For now, we will provide early drops of the compiler binary via GitHub (we’re not open sourcing the compiler). The compiler will ultimately ship as part of a Visual Studio 2015 update scheduled in the fall. 2. Objective-C runtime: Additionally, our Objective-C runtime will provide you with language features like message dispatch, delegation and automatic reference counting. 3. iOS API headers/libs: Building upon the Objective-C base APIs, we provide fairly broad iOS API compatibility. As you begin working with the bridge, and as you find an API that isn’t yet supported or could be improved, we welcome your contributions and comments. 4. Visual Studio IDE integration: Finally, we provide tooling that imports your Xcode project and ties into the Windows developer tools (Visual Studio 2015) and SDK.